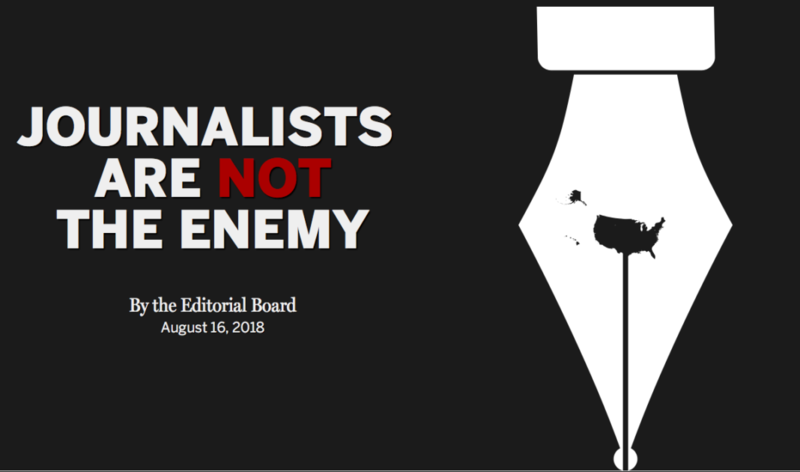 I mentioned in a previous post that The Boston Globe invited newspapers across the country to stand up for the free press with a coordinated series of newspaper editorials condemning Donald Trump’s attacks on “fake news” and suggestion that journalists are “the enemy of the people,” to be published on Thursday, August 16, 2018. (h/t Boston Globe graphic). The New York Times editorial today links to a selection from the hundreds of newspaper editorials across the country today that answered the clarion call of The Boston Globe. A FREE PRESS NEEDS YOU. (A Google search did not locate a complete list). Here in Arizona, the Lee Enterprises owned Arizona Daily Sun in Flagstaff, The press is not the enemy of the people, and the Arizona Daily Star in Tucson published editorials. Star Opinion: The free press is not the ‘enemy of the people’. 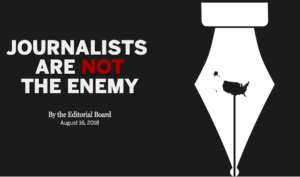 In southern Arizona, the Tucson Sentinel published an editorial, What we stand for at TucsonSentinel.com, as did the Sierra Vista Herald, We’re Not The Enemy, and Green Valley News. EDITORIAL: Reflection needed for Trump, media. While the national publication USA Today published an editorial, What our investigative journalists expose isn’t fake news, Arizona’s largest circulation newspaper, The Arizona Republic, in the USA Today network did not. 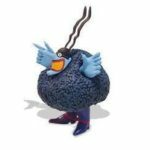 Subscribers should demand to know why. UPDATE: I am informed The Republic did publish an editorial, which I did not find onIine early this morning at azcentral.com. Good on them! If there are other newspapers in Arizona today that published an editorial, please post a mention and a link in the comments to give them the credit they deserve.